Armour + (75,000mg Water-Soluble powder).This is enough Enough powder to make 10 Litres of solution we suggest making 1-2 litres of solution at a time depending on how many larvae you are rearing and the amount of substrate you are dealing with. Whenever your substrate becomes dry simply apply some Armor+ enriched water. Shake Well before use. Contains Chitosan and benefical Amino acids. Chitosan/is a linear polysaccharide composed of randomly distributed β-(1→4) linked D-glucosamine (deacetylated unit) and N-acteyl D-glucosamine (acetylated unit).Chitosan is produced commercially by deacetylation of chitin, which is the structural element in the exoskeleton of arthapods such as crustaceans (e.g., crabs, lobsters and shrimps) and insects. it may be compared with the protein Keratin. Chitosan is a benefical additive which can be used when rearing rhinoceros/stag beetle larvae as it will help you produce large adults with thicker/longer horns and strong exoskeletons by adding extra nutritional value to your substrate. Chitosan is also a biopesticide which helps your substrate to keep away fungal/bacterial infections. Amino acids have been added to this supplement to give even more nutritional value. A small amount of Armour+ powder goes a long way. Simply dissolve 1 sachet containing 7500mg (7.5 grams) of Armour+ per litre of water and then add this water to your substrate as it begins to dry out (mix/shake well before use). Also check out our other new product "Armour+ gel" which contains Armour + powder and has been mixed with a superabsorbent polymer which will slow release moisture/nutrients as the substrate dries out and also helps to prevent drowning in the case of overwatering. 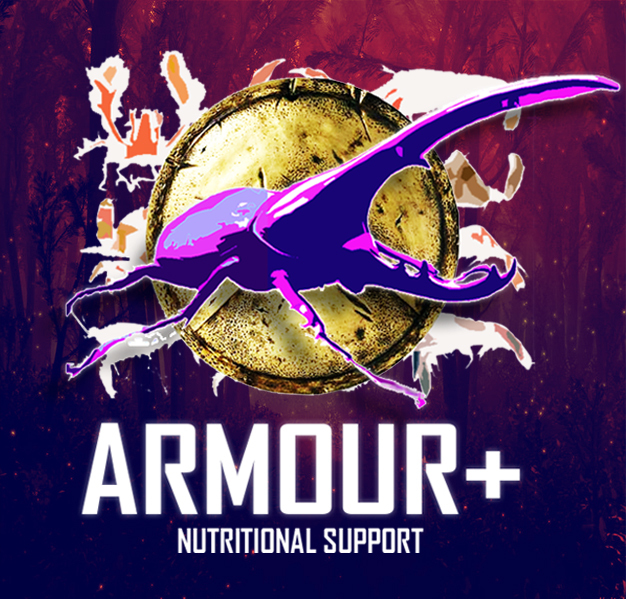 Our scales will help you accuratly weigh your Armor+ powder if you would like to make larger/smaller amounts and will help you monitor the growth of your larvae. Please note our substrates contain enough nutrients to produce large individuals these additives are for the breeder who is trying to get the very best specimen possible. Also note anyone suffering from shellfish allergy should be careful not to consume this product. The ingredients for our Armour+ powder is sourced directly from the manufacturers based in the United Kingdom whose additives have been produced to the strictest guidelines in the best possible facility. We make sure that no additional harmful ingredients are present as similar products may contain "bulking" agents and other ingredients which are not useful for our purposes. A strong emphasis is always placed on the quality of our products and services.